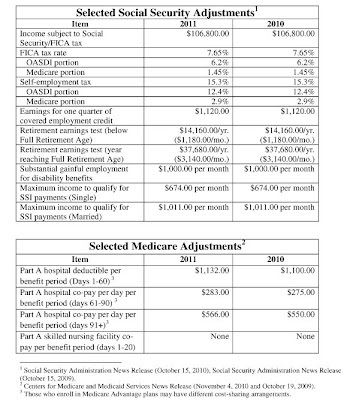 Each fall the Social Security Administration releases inflation-adjusted numbers for Social Security and Medicare. For the second year in a row, there will be no inflation adjustment to Social Security Benefits. 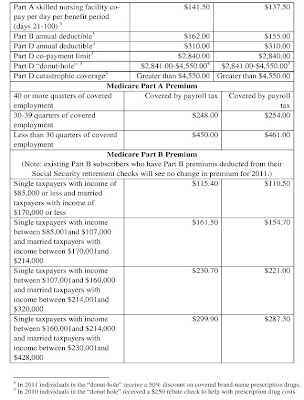 However, Medicare premiums, deductibles, and co-pays have changed. The tables below list some of the changes that could be of interest to a CSA. The National Council of Certified Dementia Practitioners is offering The National Council of Certified Dementia Practitioners Alzheimer's and Dementia Staff Education Week February 14th to the 21st Tool Kit. This tool kit is free of charge and will be available for download at http://www.nccdp.org/ beginning November 15th 2010 and ending March 1st 2011. "The Tool Kit and the declaration by the NCCDP Alzheimer's and Dementia Education Week February 14th to the 21st was developed to bring national and international awareness to the importance of providing comprehensive dementia education by means of face to face interactive classroom environment to all healthcare professionals and line staff and to go above and beyond the minimum state requirements regarding dementia education." "Currently there are no national standards for dementia education. The regulations are different from state to state. The NCCDP recommends at minimum an initial 8 hours of dementia education to all staff. Throughout the year, additional dementia education should be provided that incorporates new advances, culture changes and innovative ideas." "In addition to facilitating the Train the Trainer programs, The NCCDP promotes dementia education and certification of all staff who qualify as Certified Dementia Practitioners (CDP). The NCCDP recommends that at minimum there should be one Certified Dementia Practitioner per shift. The NCCDP recommends a trained and certified Alzheimer's and dementia instructor by the NCCDP to utilize up to date NCCDP training materials." "The NCCDP recognizes the importance of educated and certified dementia unit mangers and certifying the Dementia Unit Manager (CDCM)." "Front Line First Responders and Law Enforcement need comprehensive dementia training and the NCCDP provides Alzheimer's and Dementia training to First Responder and Law Enforcement educators and certification as Certified First Responder Dementia Trainer." "The National Council of Certified Dementia Practitioners, LLC was formed in 2001 by a group of professionals with varying work and personal experiences in the field of dementia care. The Council was formed to promote standards of excellence in dementia and Alzheimer's education to professionals and other caregivers who provide services to dementia clients. As the number of dementia cases continues to increase nationally and worldwide, there is a great necessity to insure that care givers are well trained to provide appropriate, competent, and sensitive direct care and support for the dementia patient. The goal of the Council is to develop and encourage comprehensive standards of excellence in the health care profession and delivery of dementia care." We are all aware of "spam email," the unsolicited commercial email that is sent to multiple recipients. Spam mail is annoying and Internet Service Providers are doing what they can to help filter out these types of emails. Unfortunately, sometimes the good guys get filtered out with the bad. One solution to this problem is white listing. A white list is a group of contacts or email addresses that you WANT to receive emails from. When you first receive an email, your service provider or email software will check this list. If the email has been sent from someone on this list, the email will automatically be delivered to your inbox - every time! 3. Set-up a new filter by clicking on "add"
4. Click on "Add Sender to Safe Senders List"
1. Click on the "Options" tab in the upper right hand corner and then click on "More Options"
2. Locate the "Junk E-Mail" category and click on "Safe and Blocked Senders"
3. 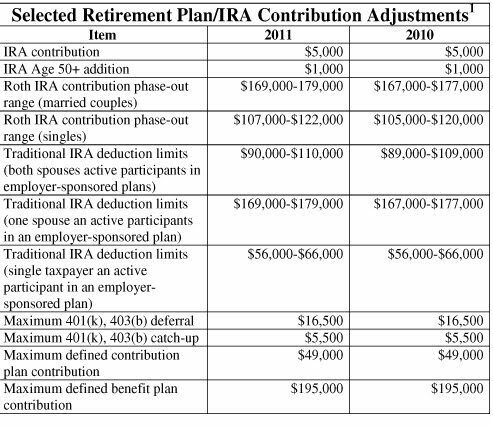 Click on "Safe Senders"
Each fall the IRS issues updated numbers for income tax and retirement plan/IRA contributions. 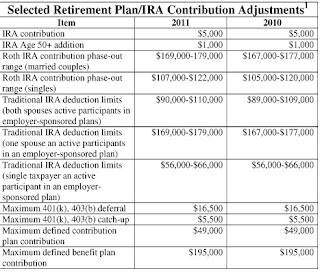 The tables below list some of the retirement plan changes that could be of interest to a CSA. Because of the uncertainty regarding tax provisions, the IRS has indicated that some income and transfer tax adjustments may not be available until as late as February 2011. (1) IRS News Release IR-2010-108 (Oct. 28, 2010), IRS Notice 2009-94, 2009-50 I.R.B. 848 (December 14, 2009). SeniorCare Organizational Systems (SOS): Alzheimer's Disease Warning Signs: "The Alzheimer's Association is so good about getting the word out about warning signs for Alzheimer's Disease in an easy to understand format..."
A brief survey has been developed by a group of leading eldercare and caregiver stress experts to help those who care for the elderly determine what level of stress they may be experiencing in their role as a caregiver. All answers to this survey are completely confidential and there are no right or wrong answers. Once completed, an assessment of your responses will give you the resources to help you make your personal caregiving experience more rewarding and maintain your own health and spirits. This assessment tool has been developed by Home Instead Senior Care, the world's largest provider of companionship and home care services for aging adults. This is not a diagnostic tool and is for informational purposes only. Check out this really neat GE Data Visualization of our aging societies around the world. This visualization allows you to compare eight different industrialized nations and the shifts in population by age group ranging from 1950 - 2050. Pension plans and asset accumulation are one side of retirement. But what about a retiree's shrinking social network and the possibility of loneliness? Do you know clients who are dreading retirement because of concern how they will keep themselves occupied or fear of the 'honey-do' list? Research shows successful retirees plan for happiness and productivity. They evaluate what's important and construct actions to satisfy their needs and wants. By creating a vision of a realistic retirement and building an action plan to achieve it, they are proactively and energetically seeking the results they desire. As a financial advisor, you can assist clients create a realistic vision of retirement including how to build a balanced health and leisure strategy and the importance of a positive attitude. "Who do you know who is successfully retired? What are they doing that you admire?" "Who do you know who is unsuccessful in retirement? What are they doing or not doing that is hindering their retirement?" "What do you need to plan for and do to be a successful retired person?" Encourage your clients to create their detailed vision of retirement and then together regularly review the vision. Ask questions such as "What's working?" "What's not working as you would like?" "What do you need to do differently?" Be open and receptive to client concerns - this increases trust and understanding within the client relationship. The added value can be monumental and it doesn't cost anything more than time. Richard Atkinson, Founder and President of RA Retirement Advisors, is an expert in pre-retirement planning. He is also author of the best-selling book, Don't Just Retire - Live It, Love It! According to the National Adult Protective Services Association (NAPSA), senior financial abuse does not discriminate by race, gender, or financial circumstances. However, the "typical" victim of elder financial abuse is a frail, white female between the ages of 70 and 89. The Investment Protection Trust has provided a pocket guide for practitioners as well as a patient brochure containing helpful checklists and resources. These attached publications are intended for wide distribution and me reproduced without written permission. I hope you will make use of them and do your part to prevent what some experts have called "the crime of the century." For more information on senior financial abuse, go to www.csa.us/freeresources to download the Elder Investment Fraud and Financial Exploitation Patient Brochure and Pocket Guide. 1. Investor Protection Trust Elder Investment Fraud Survey, released June 15, 2010. 2. "Broken Trust," MetLife Mature Market Institute, March 2009. 3. Kemp, B.J., & Mosqueda, L.A. (2005). Elder financial abuse: and evaluation framework and supporting evidence. Journal of the American Geriatrics Society, 53(7), 1123-1127. 4. "Broken Trust," MetLife Mature Market Institute, March 2009. We are so excited to expand our current efforts and provide this new way to share the latest information with our fellow CSAs, members of the public and the SCSA Staff. Created for our members, the CSA Blog was designed to act as a platform for (1) bringing the latest information relating to the senior market and (2) networking between our CSAs and members of the public. This isn't just your normal commentary blog - our blog will have weekly postings from experts in the senior market from across all industries to bring you the most up-to-date information. Plus you can read blog postings from your fellow CSAs and learn from their expertise. We encourage everyone to get involved by subscribing to our weekly postings, becoming a follower, introducing yourself to other CSA followers and...to just have FUN with it! We look forward to hearing from you! P.S. Your feedback is extremely important to us. If you have ideas on topics and would like to share them with us, please contact us today at society@csa.us.